Bangkok is the top shopping paradise for tourist who come to visit Thailand. 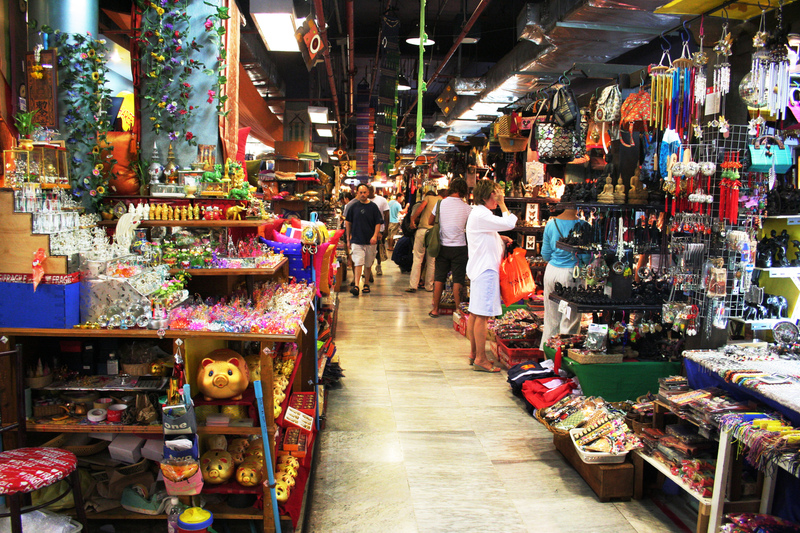 Millions of visitors flocks into Bangkok not only for holiday, but also for the unique shopping experience here. 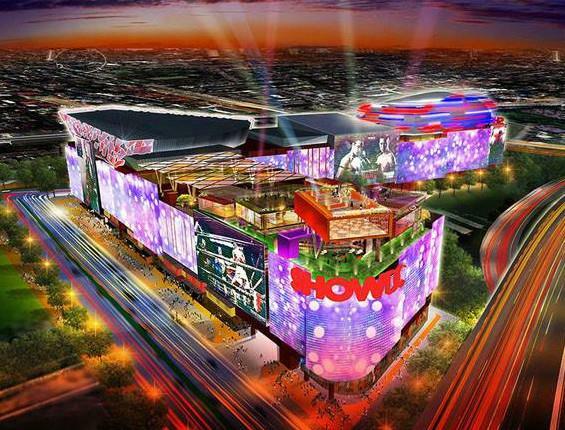 Beside the traditional night market, stalls and wholesale store at many places within Bangkok, there are many new, big and futuristic mega shopping mall being built to meet the demand from tourists and locals. In fact, some of the newly open sophisticated shopping mall in Bangkok are offering more than just shopping. You will be amazed with lots more like luxury IMAX cinema, fine dining and classy restaurants, huge children playground, cool gaming zone and probably world class spa treatment as well. 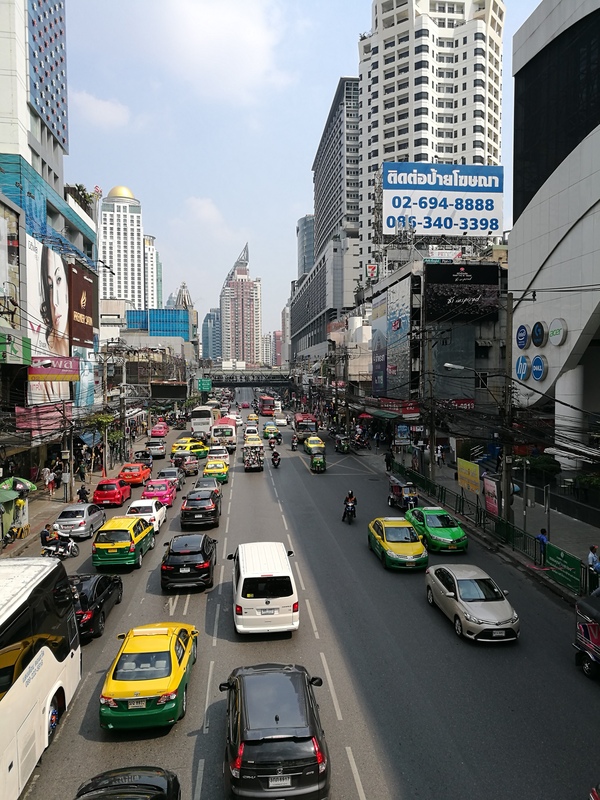 Located at Bangkok’s busiest shopping and tourism area, Pathum Wan District, Pratunam Central World is one of the most popular shopping mall among local and tourists in Bangkok. 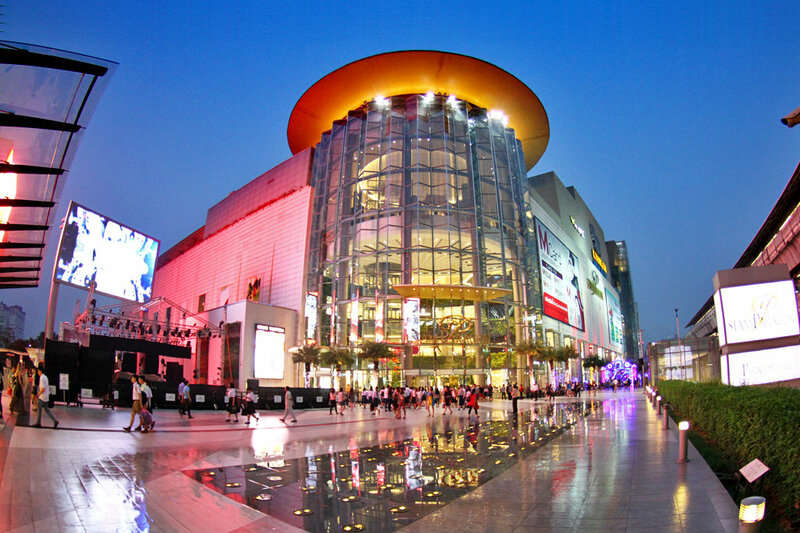 It is Asia’s 3rd and the world’s 7th largest shopping mall. You can reach there by Sukhumvit BTS as it is just next to Chit Lom BTS station. You may also take taxi or drive there, however the traffic around these areas is congested most of the time. 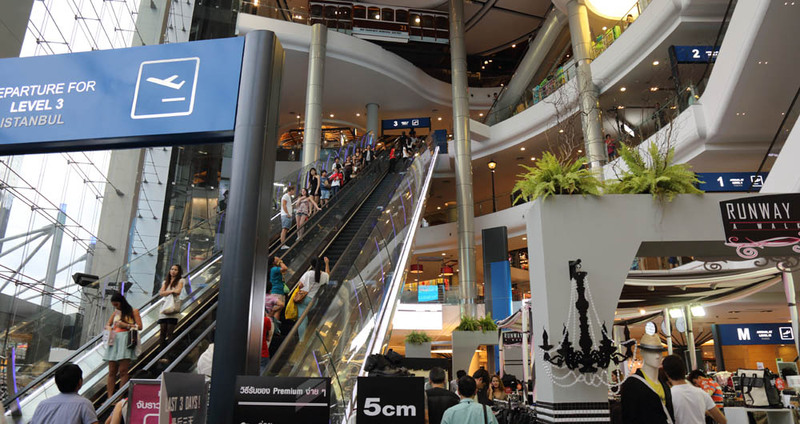 Central World shopping has 8 floors which houses countless shops, restaurants and entertainment. WIth such a large shopping enclave, you are expected to find both local and imported luxury brands here. 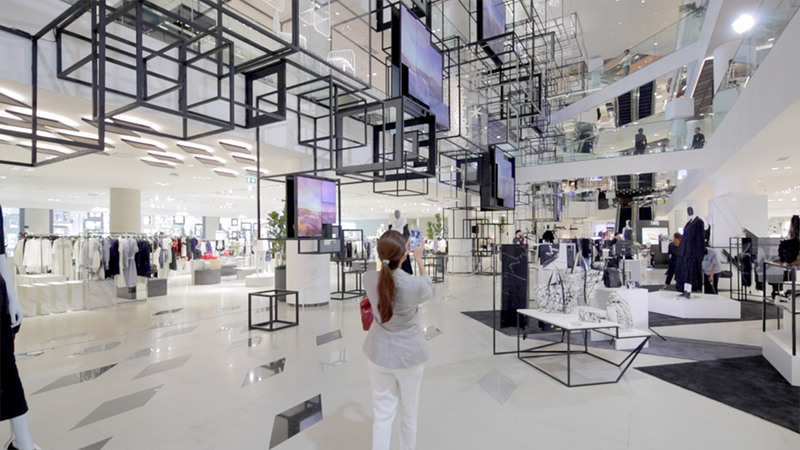 For example the 50,000 square metres Zen Mega Store which occupies 7 stories of Central World probably has every lifestyle thing that you may think of, from fashion to house appliances and food etc. Another international brand department store chain that has it’s foot here is the Japanese Isetan, which has 6 stories and selling merchandise ranging from home lifestyle needs to apparel and domestic goods. 7 th floor also has a wide selection of both local and international brands restaurants, tourists will easily find the restaurant or cuisines they want. There is a large gourmet supermarket selling with vast variety of goodies here. You may relax and spend your time at the upscale 15 screen SF World Cinema, located at the 8th floor. What makes this cinema special is that it has 800 seats of World Max Screen and luxury “1st class” theaters, which will surely enhance your movie experience. 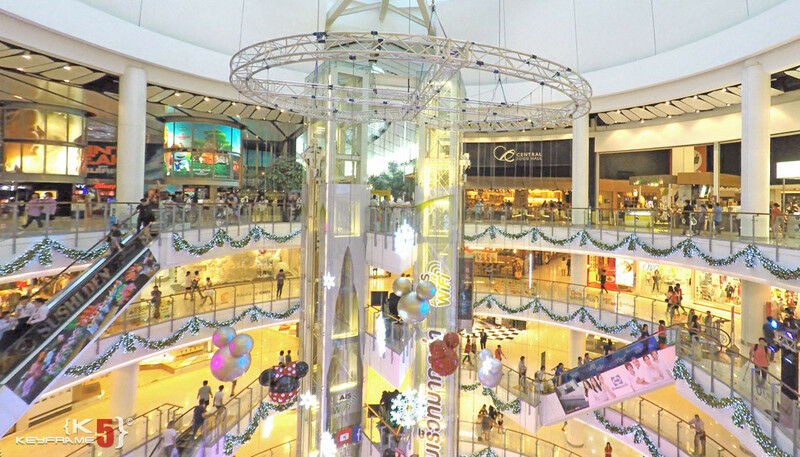 Be ready to spend at least half a day in this large scale mega shopping complex to fully enjoy what it can offer you. May be a full day here is more appropriate for real shoppers. Another opulent luxury shopping mall in the heart of Bangkok, Central Embassy is equivalent to high-end luxury life style, and place itself as the Landmark of Asia. With a vibrant, futuristic and luxurious look, it targets rich customers with high purchasing power, including rich locals and tourists who are looking for authentic luxury brands. Some elite brand names you will find here re LV, Chanel, Hermes, Prada, Gucci, Bottega Veneta etc..
On the top floor of this mall, you can the Open Space, a huge open area with a beautiful art book shop and many pleasant areas for you to rest and relax. No need to mention, there is always a big cinema complex with such kind of large luxury mall. Same to eateries, you can find all kind of international cuisines, Japan, Chinese, Western, Korean..Some of the popular restaurant here includes Sonboom Seafood, Water Library, Din Tai Fung etc..
As part of the expansion plan of EmDistrict, which consist of the 3 world class shopping malls, EmQuartier Shoppping Complex is the lastest of the plan. The other 2 are the existing Emporium and the new Emporium Sphere. Situated in the heard of Sukhumvit, surrounded by Benjasiri Park, this 3 supersize shopping complexes have a total shopping area of 650,000 sqm. If you are traveling by BTS skytrain, you may alight at Phrom Phong BTS station and walk over. 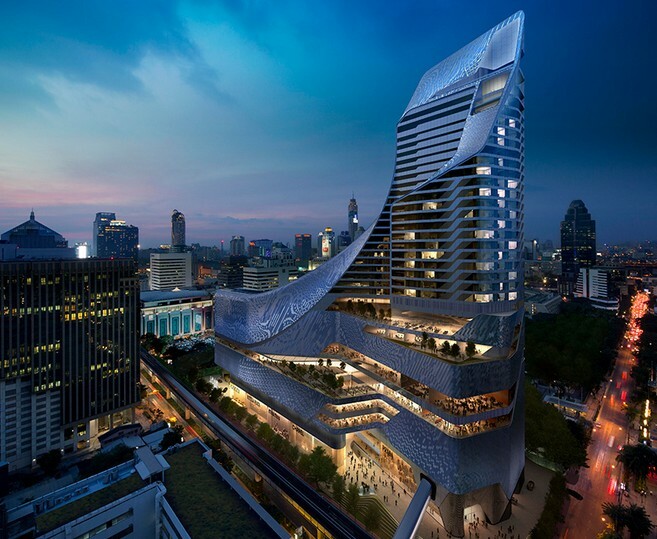 Boasted as the newest and probably the most luxury shopping mall in Bangkok, you know what brands will be occupying EmQuartier. Yes, most beauty and fashion brands, like Luois Vuitton, Diane Von Furstenburg, Chanel, Hermes to name some. As one of the top shopping complex in Asia, quality gourmet and restaurants is a sure thing here. From Chinese, Korean, Thai, Japanese, to Mexican, Spanish, Italian, Western, New England, France, you can find any type of cuisine here. For those who prefer local delights, there is also a huge food court at very reasonable price. 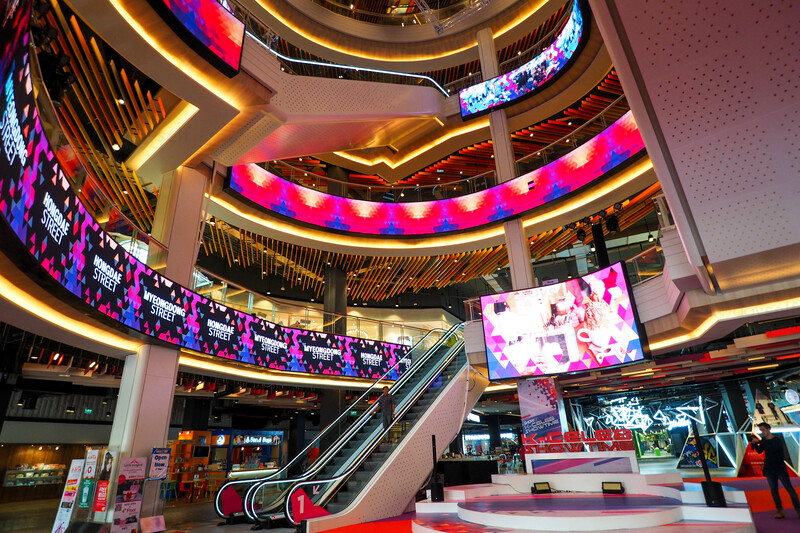 Located at the busy Petchaburi road, Platinum Fashion Mall is definitely a cannot miss shopping mall for all tourists who like shopping in Bangkok. 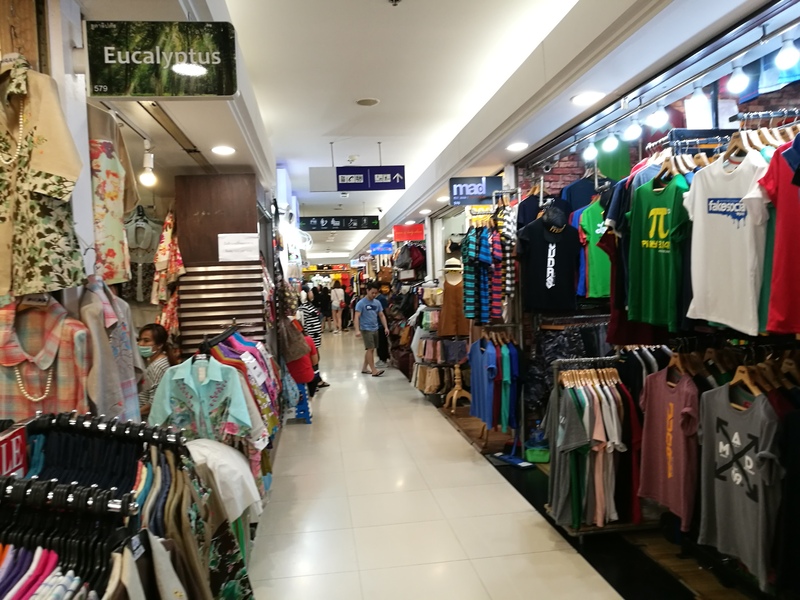 It is actually a 4-storey mall with more than 1200 small or big stores selling mostly apparel for women, men and children as well as all sort of accessories for women, souvernier and shoes. The uniqueness of Platinum Fashion Mall lays in it’s status of wholesale mall, but visitors or local customers are free to buy 1 or 2 pieces at wholesale price, depends on your negotiation skills with the sellers. It is kind of great shopping experience when you bargain the price with the seller, and this make the shopping so fun if you manage to buy what you like at bargain price. Isn’t it? Each floor is takes its name from popular cities in the world, for example, Orchard, Nathan, Oxford, Ginza, Soho, etc. Most stores focus on wholesaling, i.e., selling in large order (However, some stores allow customers to buy from 3 pieces of product to get the wholesale price), and this is considered as the most worthwhile shopping. These department stores are the one-stop-service for anyone looking for any work apparel, evening gowns, or casual apparel. 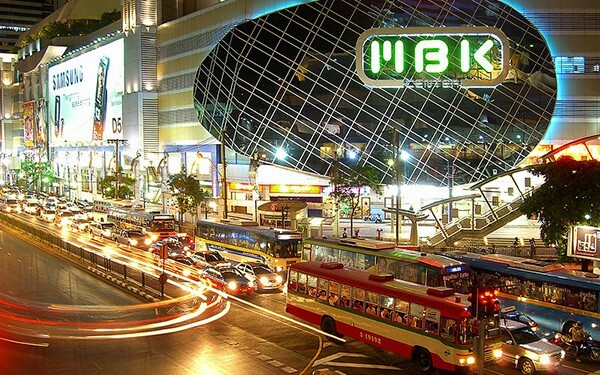 Another famous shopping mall situated in Pathum Wan district, on the southwest orner of the intersection of Rama 1 road and Phaya Thai Road, MBK Center is the Bangkok’s most legendary shopping mall. Besides taxi, you can also easily reach there by taking BT Skytrain and alight at National Stadium Station and take the direct linking walkway. MBK Center was opened in 1986, and it is a beehive of activity during weekends and even weekdays, where thousands of local and tourists flocks into MBK for bargain shopping. There are around 20000 shops in MBK Center selling good ranging from electronics gadgets, phones, cameras, drones, home appliances to garments like men, women, kids clothing, handbags, accessories etc..Not a luxury shopping mall like Siam Paragon or Siam Discovery, MBK indeed is a bargains galore, you may find almost every famous brands here, however the prices is definitely less than the market prices, and you can further bargain the prices with the sellers. Worth to mention here, besides Plaza Ethip, MBK is another heaven for mobile phones, electronics gadgets, DVD, PC games, XBOX, Nitendo Switch, Sony PS4, camera and all kinds of related gadgets and paraphenalia. 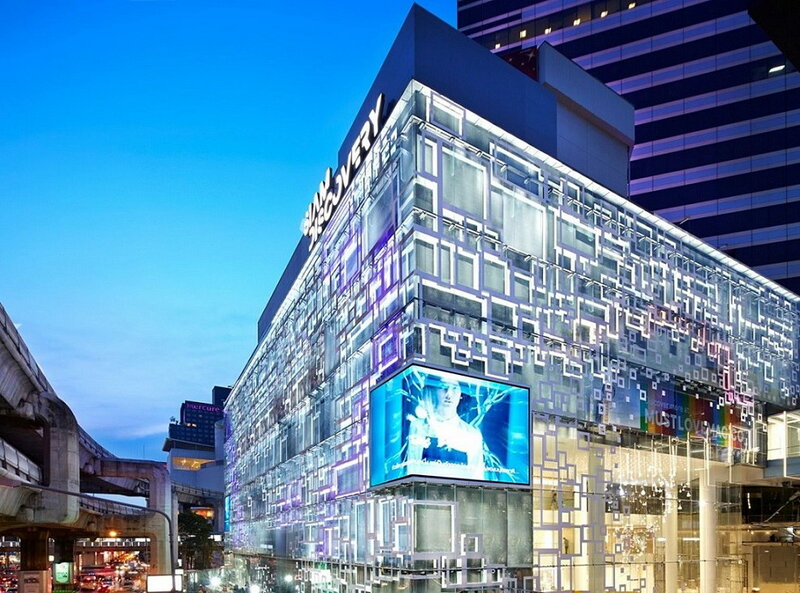 Similar to Central Plaza, Siam Paragon is one of the most famous and biggest shopping mall in Thailand. This glitzy giant shopping mall is located at Pharawan District, just sitting prominently in front of Siam BTS Skytrain station. This station is actually an interchange for two BTS lines, thus you can imagine the wave of shoppers who flock to this mega mall. It is very popular among tourists and local in-crowd who come here to hang out in style. 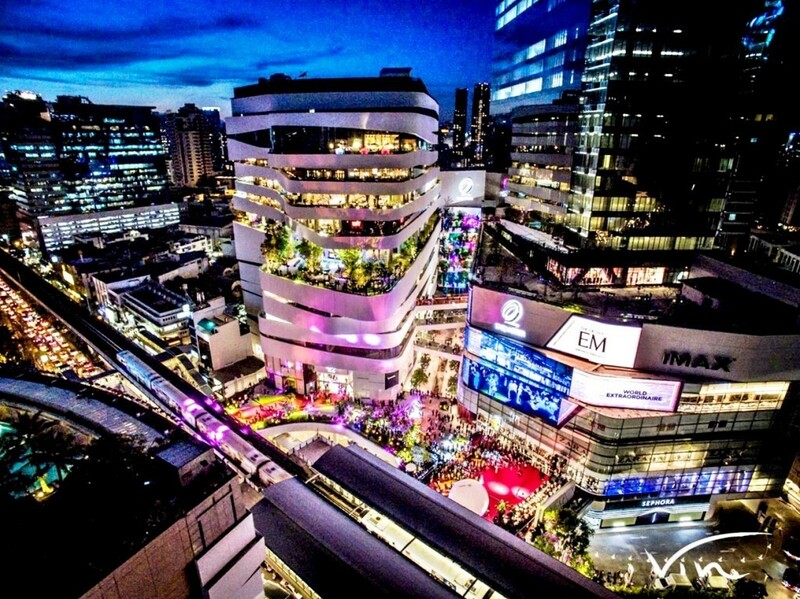 There are more than 250 stores in Siam Paragon, selling an extensive selection of international brands fashion and luxury goods, international cuisines, an exhaustive international supermarket as well as a luxury sixteen screen and IMAX cinema. It also houses a huge aquarium which could be the largest one in Southeast Asia. 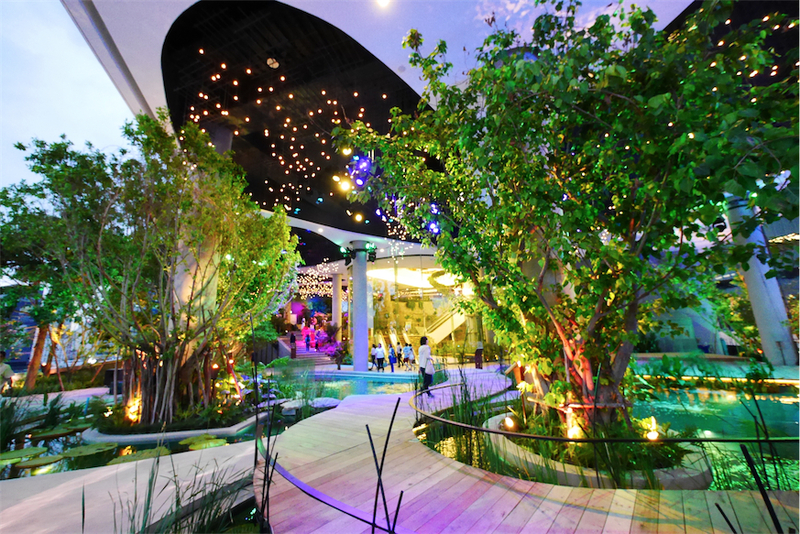 Siam Paragon has a luxury, stylish and fashionable theme. Remember to have your credit cards ready. Designer and luxury brands are clustered at prime zones, these includes Hermes, Louis Vuitton, Chanel, Prada, Burberry, YSL, Ferragamo, Versace and many more. There are large end-of-season sales held normally twice a year here, besides various on-going monthly promotions which offer could range from 5-70% normally. Siam Paragon is one of the top tourist spot in Bangkok, you will not want to exclude Siam Paragon in your Bangkok visiting list for sure. Situated at Pathumwan Bangkok, just next door to Siam Center, Siam Discovery Mall has an unique theme of “Lifestyle Laboratory”. The cool intricate architecture and futuristic interior design makes your shopping experience in Siam Discovery Mall an unique one. Branded as an exploratorium, the mall even calls their stores and shops using laboratory terms, for example HerLab, HisLab, DigitalLab, PlayLab, StreetLab etc..There are different motifs at 13 different locations, including lab equipment likes flasks, test tubes, beakers, DNA sequences, molecular structures etc..
All things here looks fashionable. With 8 floors of shopping space, there are numerous boutiques and exclusive brands here. 2 big anchor stores like Issey Miyake, Loft and Comme des Garcons are here. Other than that, Japanese brand like Loft which carries Bearbricks and other Japanese goods are here too. It is also worth to mention that, beside shopping, you will be surprised to find that the mall also has a Madame Tussaud’s Wax Museum and Ice Planet Skating Rink that cater for tourist and youngsters. Lastly, food and beverage got to accompany with day long shopping. The mall has a plethora of eating options. You can fill your stomach with variety of Thai, Japanese, Chinese and Western food at the international food court on top floor of the mall. 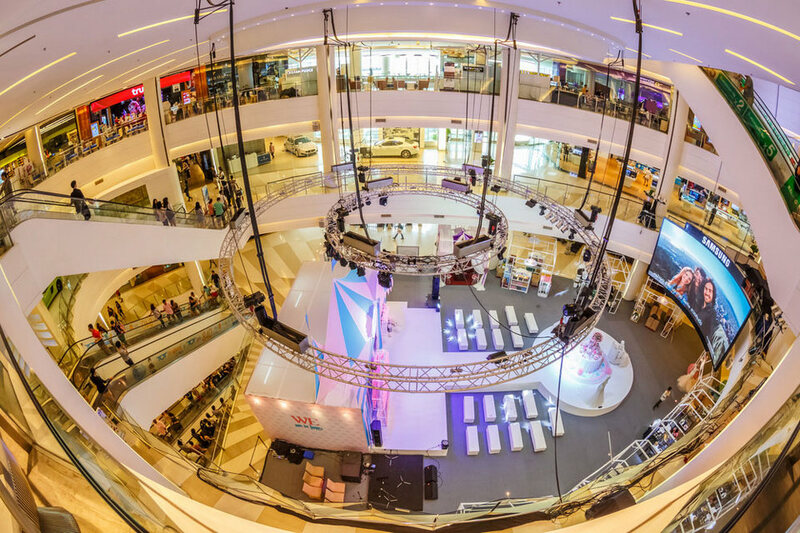 With such a new shopping concept and theme here, Discovery Mall probably is the best mall in Bangkok for you to shop or even doing window shopping. Located at Jaturatid Road, Huai Khwang District, Show DC Mall is a very new and heavily Korea-Themed mall. It house the largest Korea Town outside of Korea on it’s first floor, called K-District Mall of Korea. You can find a large selection of Korean fashion, cosmetics, health products, as well as many celebrity food and beverage outlets. You will find Korean big name like Rain and Psy here too. You can find the famous Korean brand Lotte Duty Free Shop here in Show DC mall too, seeling all best Korean and international brands at a cheaper price. Other major shops here including Current Beauty Seoul which selling latest Korean cosmetic and beauty products, Current Fashion Seoul which sell designer brands from Korean, K-Super which is a large Korean style supermarket where you can find all sort of Korean food, fruits and spices. For Korean food lovers, the K-Celebrity street food which imitate the Myeongdong Food Street in Seoul will offers you with a large selection of Korean food. 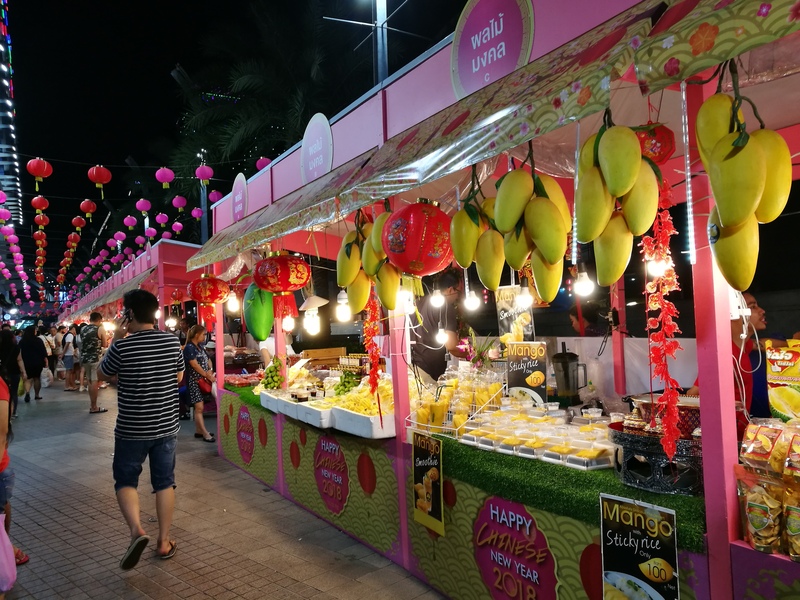 Although it is heavily K-themed, you can find the Thai Thai market on the forth floor, occupying a large area that selling the Thailand’s best products from Thailand, including souvenirs, snacks, handicrafts and local food products. Show DC mall operates as a Bangkok tourist terminal as well. It serves tourists who may on a transit but has nowhere to go after checkout. There are free shuttle services from Show DC complex to Bangkok airports, as well as to some major hotels and locations in the downtown of Bangkok. There is a tourist lounge on the 1st floor where various tourist facilities are provided, for example tourist luggage lockers, shower room, airline service counter, flight departure screen etc..If you want to shop in Show DC mall, you may register for a Show DC card to get a 5% discount. Show DC mall is an impressive entertainment Centre, with a live music concert hall that has 5,000 capacity, a modern sports arena and also a 5,000 sqm cultural facility, the Himmapan Avatar. You can catch a 4D show called Himmapan Avatar which is a multi-dimensional fantasy live show with a mystic ambiance and holographic. Advanced technology is used to create optical illusions and add dimensions to objects, creating a multi-dimensional experience. The shows is about the story of battle between good and evil in the legendary forest of Himmapan which is inhabited by mythological animals. ThIS is a daily show and will sure bring a lot of fun for old and young. If you have watched Ong Bak Muay Thai Warrior movie, then you have a chance to watch this Ong Bak live show here as well, which demonstrate exciting martial arts skills and acrobatics of Ong Bak with scenes like hand to hand comabt and tuk-tuk chase etc.. There is also a Korean style rooftop bar and club at the 6th floor of Show DC mall, with lot of K-Pop and Hip-Hop music to enjoy. If you are a Korean fan, or if you just wanted to have a place that you can have a day of full fun, Show DC mall should be your top choice in Bangkok. BTS skytrain: alight at Asoke Station and take exit 1, walk directly to the mezzanie level of the mall through the walkway link to the mall from the station. Located on Sukhumvit Road, near the Asoke intersection in Bangkok, Terminal 21 is famous for its incredible themed washrooms. Hotel Centrepoint is part of Terminal 21 building as well. 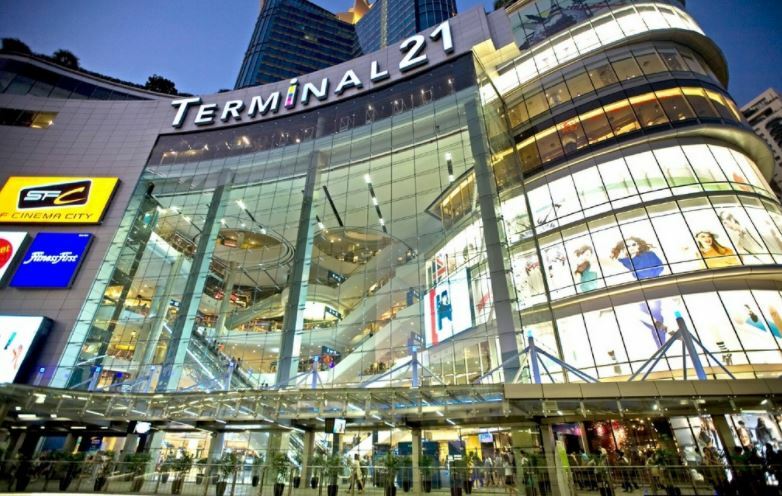 If you are like shopping in world famous shopping districts in the world, Terminal 21 probably the best place for you. Design with a cutting edge shopping concept, Terminal 21 has some of the world most famous cities all under one roof. For example, London’s Carnaby Street, Fisheman’s Whart in San Francisco, Istanbul Zouk or Tokyo’s shopping district. You will fee you are traveling to various countries cities across the world from Paris Champs-Elysees to London Carnaby Street and from San Francisco to Istanbul and Tokyo Shibuya. Terminal 21 a huge mall with over 600 shops, about 50 restaurants and cafes，a Cineplex, Gourmet Market and a large food court. It is a mall more for an affordable mid range quality goods. There are total 9 floors and different levels are themed according to different travel destinations. The Caribbean themed basement level (LG) has a Gourmet Market as well as many food outlets and banks. You can find some very good food here. One level up, it is Rome themed ground floor (G) with all sort of international and local brand fashion such as CC:OO, Adida, Kipling, Fox, Levi’s etc.. The M floor is themed as Champs-Elysees of Paris, where a lot of famous brand fashion are waiting for you. Now when you are on 1st floor, you will find yourself actually in a street in Tokyo, where most of the fashion and items are dedicated for women. One more level up is the London shopping street, where most of the items are for men only. Istanbul themed street, which has a look and feel of a modern Middle Eastern zouk, is on the 3rd floor. There are many shops selling jewellery, toys, beauty products and fashion accessories. After shop all the way from GF to 3rd floor, now you should feel peckish. Here come 4th and 5th floor, where you can see the iconic San Francisco Golden Gate bridge is hanging here. There are more than 50 restaurants and cafes on this 2 floors vying for your attention. You can find variety of food here, from Chabuton, Dory Seafood Bistro, Secret Recipe, Fuji, Ootoya, Swensen’s, Pepper Lunch to Fisherman’s Wharf.. There is also a street style food court at Pier 21 on the 5th floor, with large variety of tasty food available at very reasonable price here. Mango sticky rice, Hainanse Chicken rice, Roast Duck, desert, seafood, phad that etc..and etc.. 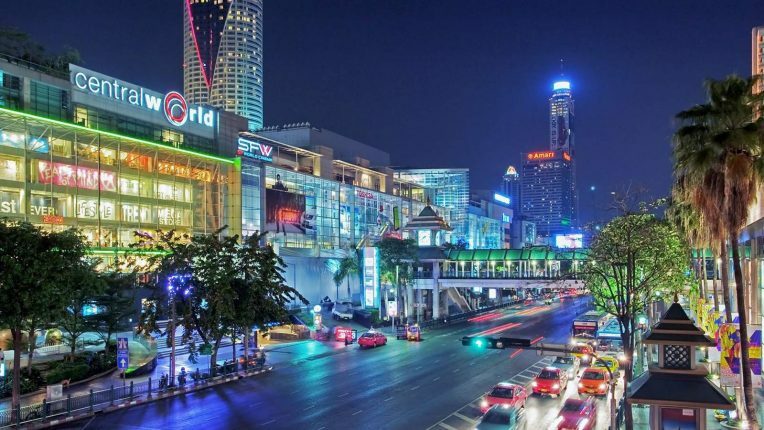 Being a shopping crazy captial in the world, Bangkok has transformed the street like whole sale market to opulent shopping stalwarts like Central Embassy, Siam Paragon, Terminal 21, Siam Discovery Mall, Show DC Mall, CentralWorld. With such variety of shopping options to choose from, Bangkok will definitely gives you an endless and unforgettable shopping fun and enjoyment.